We have written extensively about our Special Flight Operations Certificate (S.F.O.C.) in the past. A quick review – the S.F.O.C. 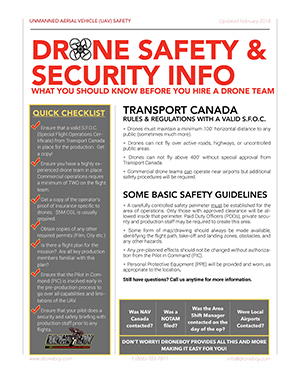 document is our flight permit issued by Transport Canada (TC) that enables us to fly drones commercially. The S.F.O.C. comes in a variety of “flavors” and is of utmost importance to our business and our ability to service our customers in a timely manner. Without a valid S.F.O.C. we can not fly! When a company starts out flying drones commercially TC requires that they obtain an S.F.O.C. for each mission which can be a slow and arduous process indeed. It takes a minimum of 21 business days to get one and, let’s be realistic, what production really knows what they are doing a whole month in advance? After a period of time the drone company develops a track record of safety and then TC will issue an annual Standing S.F.O.C.. DroneBoy has had a Standing S.F.O.C. for each of the five flight regions in Canada for over three years now. DroneBoy recently took it a step further when we received our Compliant Operator S.F.O.C.. This top level flight permit is in addition to our Restrict Airspace endorsement that came into play this summer. What the Compliant Operator S.F.O.C. means is that our company is flying a number of compliant certified drones. These are UAVs which Transport Canada has determined have an even higher level of design, build quality, safety and overall conformity. It also means that our operations, staff and operational history is at the very highest level attainable. Only 6 other UAV service providers in Ontario have achieved this level. All other compliant operators are in the industrial sector or law enforcement whereas our main focus is flying for film and television productions. It is here that we feel our Compliant Operator status truly sets us apart.